A beloved bagel in Boston available in only a dozen Finagle a Bagel shops has made its way to the freezer cases in grocery stores up and down the East Coast. 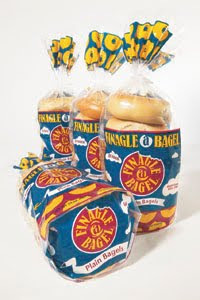 SJB Bagel Makers, Boston, the operators of Finagle a Bagel shops, has introduced a 4-ounce, frozen Finagle a Bagel in Giant and Stop & Shop supermarkets. The frozen bagel rollout is an extension of the fresh bagel business conducted by SJB Bagel Makers in various supermarket chains' in-store bakeries. The frozen product under the Finagle a Bagel brand is available in plain, egg, cinnamon raisin, onion, and 100% whole wheat flavors. "The freezer sections of grocery stores don't always carry the same quality of bagel that consumers find in bakeries," says Laura Trust, president, SJB Bagel Makers. "We wanted to provide a true hand-boiled and baked bagel to our guests who were not able to get to our retail stores. "We make every Finagle a Bagel bagel by hand, using the same recipes, dough and methods as the bagels we make in our Boston area bakeries," says Trust. Finagle a Bagel has also introduced a new foodservice product, Bailey's All Natural Bagels, which are available in cafeterias in schools, nursing homes and hospitals in New York and New England served by Agar and Perkins, Renzi Brothers, and HPC foodservice distributors.